This is a Linear Multi-Code 308301 Two-Channel Key Ring Remote. 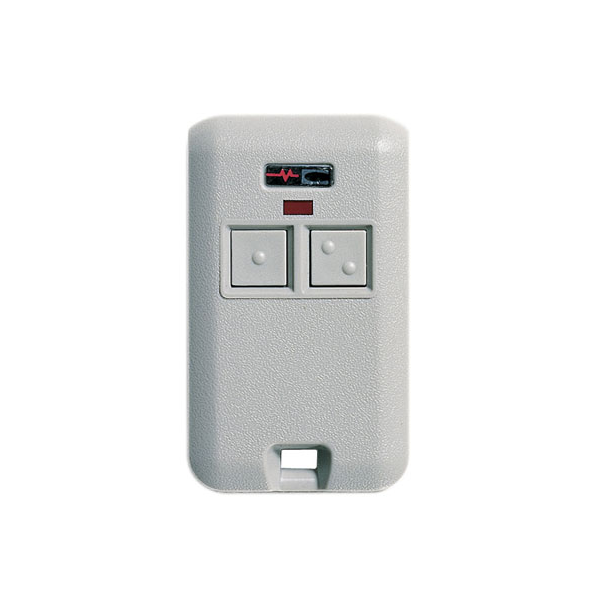 This transmitter is a miniature style transmitter designed for automatic door and gate operator applications. It is a two-channel device. Pressing the left button on the transmitter will send a channel-one signal. Pressing the right button on the transmitter will send a channel-two signal. The buttons feature raised dimples for easy or vision-impaired identification. The transmitter has a red test/operate indicator and is powered by a 12-volt battery. A molded-in hole in the case is for attaching the transmitter to a key ring. It is compatible with 300-MHz Multi-Code receivers and model 109950 and 302850 receivers.